Robot Chicken's Seth Green, Matthew Senreich and Zeb Wells took over the DC All Access web series to promomte the show's upcoming DC Comics Special II: Villains in Paradise, airing Sunday, April 6 on Cartoon Network. The trio are joined by DC's Geoff Johns to show off new footage and discuss why they decided to center on the villains in this special. They also tease that the plot takes these evil characters to the beach, with each bad guy getting their traditional outfit along with a beach costume as well. We also hear from Alfred Molina (who voices Lex Luthor) in this seven-minute behind-the-scenes look before the special debuts this Sunday. Faster than a speeding bullet! Well, maybe not but quality takes time. Stoopid Buddy Stoodios, in partnership with DC Entertainment and Warner Bros. Animation, will premiere a sequel to their acclaimed Annie Award-winning Robot Chicken DC Comics Special in 2014. 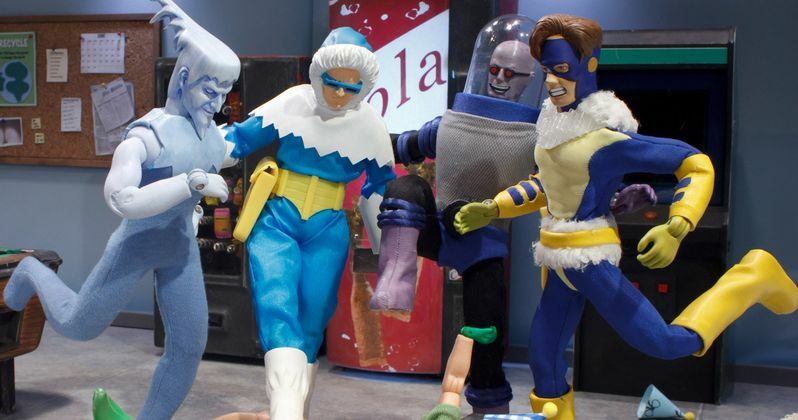 Robot Chicken DC Comics Special II brings you the awesomeness of the DC Comics universe of characters as only Robot Chicken can, with amazing guest stars and the stop-motion sketch comedy you've come to love after six seasons of the popular Adult Swim series. Executive producers for the second Robot Chicken DC Comics Special include Stoopid Monkey's Seth Green and Matthew Senreich , DC Entertainment Chief Creative Officer Geoff Johns, Warner Bros. Animation's Executive Vice President, Creative Affairs Sam Register, and Stoopid Buddy Stoodios' John Harvatine IV and Eric Towner.